Gunky and gross brushes are bad for your hair’s health. Dust, mold, natural oils, dead hair and hair products can build up on hair grooming tools. The longer you use your brushes and combs between cleaning, the more troublesome these additions can become. Think about it. Do you really want to shampoo and condition your hair, and then run stale hair products, dirt and other junk back through your fresh locks? 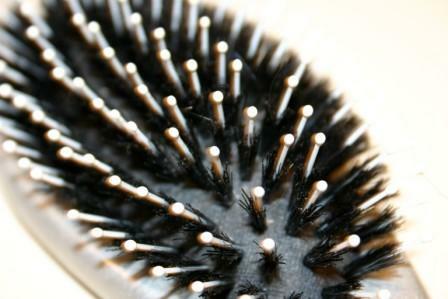 It’s easy to clean your hairbrushes, once you know how. Don’t toss those dirty hairbrushes. You can wash them, and reuse them. Just follow these five simple steps. 1. First, remove all of the dead hairs from your hairbrush. Do not try to scrub two brushes together, as this can damage the bristles. Here’s a better idea that even works with round brushes or large paddle brushes. Grab a pair of manicure scissors, and cut the tangled strands between all of the bristled rows on the brush. Then pick out all of the hair, and discard it. Try to hold the brush over a trash bin, as you do this. 2. Fill the bathroom sink (or a large bucket) with fresh hot water. Add about 1/4 of a box of baking soda to approximately two quarts of water. Do not try to clean hairbrushes with shampoo, as many suggest. This only leads to more product buildup. Stir the water with your hairbrush. Submerge your brushes in the sink, and let them soak for about 15 minutes. Toss your combs, barrettes and gripper clips into the drink as well. 3. If brushes or combs are particularly sticky or dirty, scrub them with an old toothbrush and a bit more baking soda before soaking them some more. Be extra gentle with brushes containing natural bristles. 4. Rinse all items thoroughly in clean, warm water. 5. Lay brushes and combs out on a soft, clean towel to dry. How often should you clean your hairbrushes? If you use them daily, it’s a good idea to wash brushes and combs at least twice a month. Shared hair care tools should be cleaned more often. Clean hairbrushes and combs are much healthier and considerably more useful as hairstyling tools than sticky, goopy, hair-filled ones. Maintain them regularly, and they will serve you well for a long time.